TheTrainLine.com is a website that allows UK rail passengers to buy their tickets online. It has just introduced booking fees, meaning that a ticket booked with TheTrainLine now costs more than buying the same ticket at the station. Fortunately, there are alternatives. The slippery slope to booking fees started some years ago, when TheTrainLine introduced a charge for paying by credit card. This then increasaed from £1 to £1.50, £2, and is now an extortionate £2.50. The fee could be avoided by paying by debit card. The newest fees are £1 for having the tickets posted to you, or 50p if you choose to collect them from a “FastTicket” machine at a railway station. These latest fees can not be avoided, as you have to obtain the tickets somehow. So what is the alternative? It is important to remember that it’s possible to buy any rail ticket from any outlet. You don’t have to buy the ticket from the station your journey starts from or from the same train operator, and you can also buy cheap, advance tickets in person. TheTrainLine’s claim that they can save customers £63.28 on an Edinburgh to London journey, for example, is quite misleading as they are comparing an advance purchase ticket with one bought on the day of travel. The cheaper ticket could be bought at your local station, assuming it was convenient to go there. Of course, it’s not always convenient to go to the station to buy tickets. Even if it’s nearby, there may be long queues, or it might not be manned at the right times. The customer can also never be sure the person in the ticket office has explored all the ticket options to find the cheapest, which can be quite time consuming. Fortunately, most of the train operating companies operate their own ticketing websites. For example, I use the website of my local operator, First Great Western. Once again, remember that it’s possible to buy any ticket from any outlet. Just because you are using a particular train operator’s website doesn’t mean the journey has to involve travel on that operator’s trains. Most of the operators’ websites are actually provided by none other than TheTrainLine. Anyone used to the latter would feel quite at home. The layout and interface are practically identical, it’s just the colours and branding that are different. It even appears as TheTrainLine on your credit card statement! However, unlike TheTrainLine’s own site, the train operators’ own sites don’t levy the extortionate additional charges and booking fees. 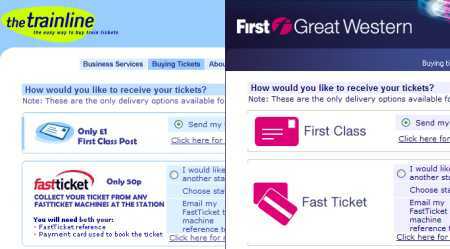 At the time of writing, if you book a ticket with First Great Western, it is free to have the ticket delivered or to collect it from a FastTicket machine, and there is no credit card fee either! Therefore, it’s possible to save up to £3.50 just by using a site with different branding. In addition, TheTrainLine insists on selecting insurance for the journey by default, which the customer must remember to deselect. First Great Western leave the insurance option unselected so that the customer need only check the boxes if insurance is required. According to Wikipedia, TheTrainLine accounts for 20% of all train tickets by value. It also runs the websites of 16 out of 20 of the train operating companies, most of which don’t charge additional fees. So next time you book a train ticket, please try the site of one of the train operators. You’ll save yourself some money, and hopefully reduce the market share of TheTrainLine.com, whose position as the largest retailer of tickets has clearly made it complacent, to the extent that it believes it can rip off its customers without them going elsewhere for their tickets. Excellent article, although it should be pointed out that the new website operated by National Express East Coast (previously GNER, http://www.nationalexpresseastcoast.com) is the only website operated by a Train Operator that is not operated by the Trainline, so if you book here you wouldn’t be giving them any money. Like the others it does not charge any fees and does not book insuranbce by default. For advance tickets on the East Coast it offers a permanent 10% discount not available anywhere else, and sells tickets for all train journeys in the UK. The interface is really user friendly and allows you to easily look at all trains for the day. It also has a low fares finder which shows the best fares on specific dates regardless of a return or two singles. Try it, it’s great! booking a single ticket from Manchester to Barrow-in-Furness is £7 and a single ticket from Barrow-in-Furness to Ravenglass s £6.50! Thats £19.50 CHEAPER than the ‘cheapest’ ticket TheTrainline offered! Can you book two single tickets on TheTrainline – well yes, but it is two transactions – two credit card fees and two lots of postage! Goodbye TheTrainline – it used to be good! To be fair, two tickets being cheaper is more due to the overly complex and esoteric National Rail ticketing system, rather than being specific to TheTrainLine. After you have selected the collection/postage method, but before you pay, there is a “Book another journey” button. That means you only have to pay one credit card fee. If you choose to have both tickets posted, you (surprisingly) only have to pay one postage fee. However, if you choose FastTicket collection, you do have to pay an additional 50p for each ticket. I take your point and am very aware of how dysfunctional the UK travel network can be. I just feel that as a customer asking for advice on travel I should be able to trust the people who’s job (read: professional responsibility) it is to find the best value fares. TheTrainline advised me that the cheapest option available was £33 – and that is simply wrong it’s £13.50! Whether this is incompetence, laziness, a fault in the system or malicious is largely irrelevant – I am still being given incorrect information and am potentially out of pocket! All this means is that I can’t trust them as they are clearly not providing the service they claim to – this is devastating for their business (certainly from my perspective; I have no stake here and I really couldn’t care less) as the end result is that I will simply go elsewhere – probably to the kiosk in the station where I can talk to a real live person and investigate all available options – to their credit they are usually very helpful; the lady who helped me yesterday was lovely, better than any of the ticketing web sites any day! All that help, the best value tickets, a friendly natter and no booking fees, postage costs, registration forms, failed queries, naff design, broken web pages, insurance offers, hotel offers, hire car offers or divulgence of personal information and subsequent marketing harassment… anywhere in sight 🙂 I’ve come over all nostalgic, remember the days when none of this was available – do computers really make our lives better? I didn’t find the ‘book another journey’ button when I tried. I’ll take your word for it! The “book another journey” button’s still there as I tried it. It’s not at the most intuitive stage of the buying process, though. I doubt station staff will look at every combination of separate tickets to find the cheapest one unless you push them to. I actually prefer booking online as it means I am able to do this for myself. It takes a great deal of patience, though, as the web interface isn’t great as you point out. They say they are working on a web interface to do it, but it’s said that for a couple of years now so don’t hold your breath. Thankyou for the article – I have used the trainline.com for years but couldn’t believe it when I saw the new fees! 50p to pick up the ticket yourself from a machine….er no thankyou! Instead I had booked my tickets through the Virgin website, as you say this can be for any train company and no fees charged at all. I complained to the trainline and just received a standard response. I hope you publicise this further – I think its one for Watchdog surely? I agree with Bill, the http://www.nationalexpresseastcoast.com web site is really excellent. It’s a much better site than trainline. However, assuming it works with same back end, it will still find the same fares. Thanks so much for this post. Am beyond livid with thetrainline.com HOW arrogant to think they can just start charging customers for old rope? 50p to pick up a ticket from a train station? Pah. Have also TOTALLY had it with their overseas call centres. I’m only 28, but they’ve prematurely turned me into a grumpy, letter-writing old lady! The trainline are now trying to charge 50p for the use of debit card! Well said – surely they must be steadily losing business? When thetrainline first started I used it all the time and thought it was great. Now I use it as the basic first step for my journey, see who’s operating the trains I want and then go to their site (powered by thetrainline) to buy from them instead (without any fees). Though the other thing to worry about is the appallingly designed and over-complicated user interface on the fast ticket machines at the stations! I have recently paid for a ticket with with a debit card and they insisted that I had paid with a credit card, incurring a £2.50 fee. I have to send them my bank statement to claim the money back. How many other people have they caught out with this scam and how much are they raking in from those who don’t reclaim the money or the interest they earn on it all? I bet it happens too often for it to be a mistake!! I have been trying to contact the Trainline by phone but only have an 0870 number. The ‘say no to 0870’ website doesn’y recognise it. Does anyone know the standard landline number so I don’t have to pay them any more fes just to phone them? Yesterday (6th November) I purchased 2 return tickets from Lancaster to London Euston (collection reference no NKF8G43H). I had been having problems with your website all day trying to process the payment as each time I put my payment through a red error appeared saying the transaction hadn’t been authorised and wouldn’t let me proceed with the booking. I tried it with my card around 7 times another debit card and my boyfriends card and each time the error kept appearing then finally last night around 8pm I managed to book the above. I thought I would check my on-line banking afterwards to make sure the payment had gone out only to realise that the train line had taken the payment 7 times on one card and once on two other cards. As you can see the train tickets are all for the same day and times and we only have the one booking reference. As you can imagine I need this money refunding ASAP as this error has taken me £670 over drawn and i have a mortgage and bills to pay. I have had two recent very unfortunate experiences wityh The Trainline, and will never use their ‘service’ again. Most recently, they failed to send me a ticket (or it got lost in the post), then five times undertook to fax a duplicate to Portsmouth Harbour station, who five times claimed that they had not received it. I finally purchased a replacement ticket through SouthWest Trains, who at least have a reasonable Customer Service follow-up department, and am now trying to pursue The Trainline for a refund. Judging from their unwillingness to respond to me, they are pretty inured to criticism of this kind. Who regulates them, anyway. Does one have recourse to anybody other than Trading Standards or the Courts? Further to the above, I have taken the matter up with Passenger Focus. These people who say that we should be writing to The Trainline themselves about their shortcomings obviously haven’t tried – they’ll be ignored if they do. As to TOCs websites, it seems that whichever you go to, what is actually happening is that you are purchasing from The Trainline who ‘power’ all their sites. This is nothing short of scandalous and I have written to Geoff Hoon about it. This company is daylight robbery. I booked tickets with them and never recieved these tickets. They told me there is nothing they can do and not only that i fi wanted the tickets again i would have to pay 10 pounds each way for reprints… they are a nightmare company!! i have spent 40 pounds in phone calls to these horrible people DO NOT USE!!!!! I bought 4 advance return tickets to London in september 08 and had to return them. Got an e-mail saying it would take 10 working days and I’m still waiting 5 months later! I’ve phoned them 8 times since Jan 09 and been lied to and fobbed off about my £100. They won’t let you speak to anyone in the refund department, probably because the call centre is in India (08700101296) and the refund department is in a different country altogether. This is tantamount to theft in my opinion. I’ve actually got through and after creating a fuss spoken to the Floor Manager…more lies…still no refund in my account. I’m keeping Watchdog informed.